The My Passport Wireless Pro ameliorates every complaint we had about its predecessor. It's as good as it gets in portable Wi-Fi drives. We had only two real complaints about WD’s original My Passport Wireless media-streaming Wi-Fi hard drive: short-ish battery life, and an inability to charge other devices. 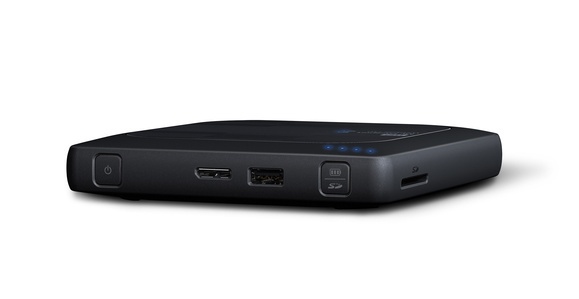 WD has remedied both shortcomings with the all-new My Passport Wireless Pro. This is a thoroughly improved and much more capable product. If you’re new to wireless media-streaming hard drives, they’re basically a marriage of Wi-Fi hot spot and battery-powered USB storage. In this case, you get a dual-band 802.11ac hot spot and either 2TB ($294) or 3TB ($329) of storage. Log onto the hot spot the My Passport Pro creates and you can stream music, video, or photographs from it to your laptop, tablet, or smartphone. You can also use it for like a NAS box or even a direct-attached USB 3.0 portable hard drive. Unlike its very thick predecessor, the My Passport Wireless Pro could easily be mistaken for a portable optical drive (you remember those, right?). Except that this enclosure sports a micro-USB 3.0 connector, a USB 2.0 Type A port (for charging other devices from the drive’s battery), and an SD memory-card slot (for transferring files—automatically on insert, if you so choose. You can push a button if you don’t.) The new model weighs in at nearly a pound--that's four ounces heavier than the original--and we're pretty sure it's attributable to the 6400 mAh battery. The Wireless Pro’s two USB 3.0 ports and SD card slot are visible in this side shot. The new Passport Wireless Pro is even easier to set up that its predecessor. With my iPad, all I had to do was select the My Passport network, join using the password prominently displayed on a sticker on the front of the unit, and then open Safari. The browser headed directly for the setup routine without my having to type in the URL for its configuration page. It also walked me through the process of connecting the parent network to pass through the Internet connection. Smooth. Easy. Good job WD. Note that Plex requires signing up for a free account. Twonky does not, and it does a pretty decent job streaming movies and audio to client devices. 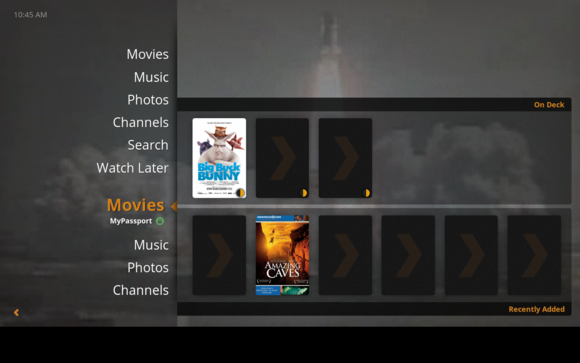 The addition of the Plex media server lets the My Passport Wireless Pro support more devices, more easily than the Twonky DLNA server, which is still included as well. As to those extra four ounces of battery. Wow. The My Passport Wireless Pro more than doubles its predecessor’s four-hour run time, delivering 9 hours and 10 minutes in our test. And that was with the drive in performance mode; there’s also a battery-save mode that squeezes out about an extra half hour to forty-five minutes. If you don't need to stream on battery power, that kind of juice can go a long way to charging other USB devices. Used as a direct-attached USB hard drive, performance was a slightly below average. AS SSD rated the drive as reading 10GB sequentially at 120MBps, and writing it at 113MBps. Our 20GB large-file copy tests came up with almost exactly the same rates; however, speeds dropped significantly with our 20GB batch of smaller files and folders: to 75MBps reading and 55MBps writing. The My Passport Wireless Pro performs well as a USB 3.0 hard drive. 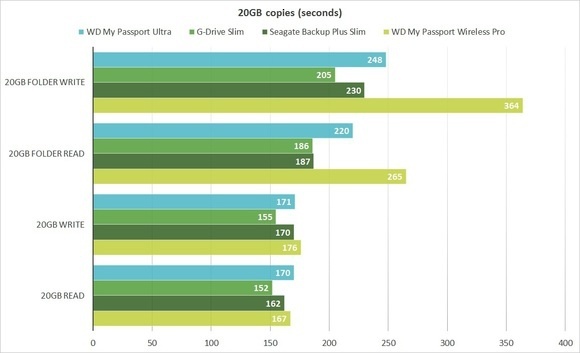 The 20GB file and folder write performance will increase significantly if you re-format the drive from exFAT to NTFS. Small-file write performance improved significantly after I re-formatted the drive from exFAT to the NTFS files system that the other drives in the chart used. That said, exFAT formatting can’t explain the slow reading of the 20GB batch of files and folders, where exFAT and NTFS generally perform the same. If you're planning to use the drive with a Mac, on the other hand, you'll want to leave the drive formatted as exFAT: Macs can read NTFS-formatted drives, but they can't write to them. Streaming was a mixed bag of easy and not so easy. This wasn’t the Wireless Pro’s fault, but the uneven implementation of streaming protocols across platforms. In all cases (Android, iOS, OS X, Windows 10, Windows 7, and Windows Phone) I was eventually able to stream 1080p video, though in some cases it required switching apps on the client devices and/or switching between Plex and Twonky. Streaming 2160p files (4K UHD) didn’t work, but that's no surprise: Streaming those files over most ethernet connections can be iffy; besides, there’s not a lot of 2160p content out there. The issues I did encounter were with the Windows Media Player (LAV filters) and Twonky server streaming to 32-bit Windows 7, which stuttered continually even when I lowered the resolution to 720p. I’ve never had problems with that laptop and other implementations of Twonky so that’s a bit of a puzzler. Additionally I continually received connection errors when I tried to stream from Plex to a Windows Phone. Although it did display thumbnails of the movies, I was never able to stream to that device. I also encountered issues with oddball codecs, but you’ll do fine if you stick with the common ones--MPEG-1, MPEG-2, h.264, WMV, and the like--and your clients use modern 64-bit operating systems. The My Passport Wireless Pro ameliorates every complaint we had about its predecessor. It has a lot more juice, it can stream one way or another to every portable device out there, it's easy to use, and it has the ability to charge other devices. That’s as good as it gets in portable Wi-Fi drives.